The third issue of the Art Los Angeles Reader is available on the occasion of the 2017 edition of the fair. The free newspaper engages with critical and provocative ideas regarding contemporary art, asking acclaimed writers to reflect on the relationship between the art community and the aesthetic, political and social dimensions of Los Angeles. 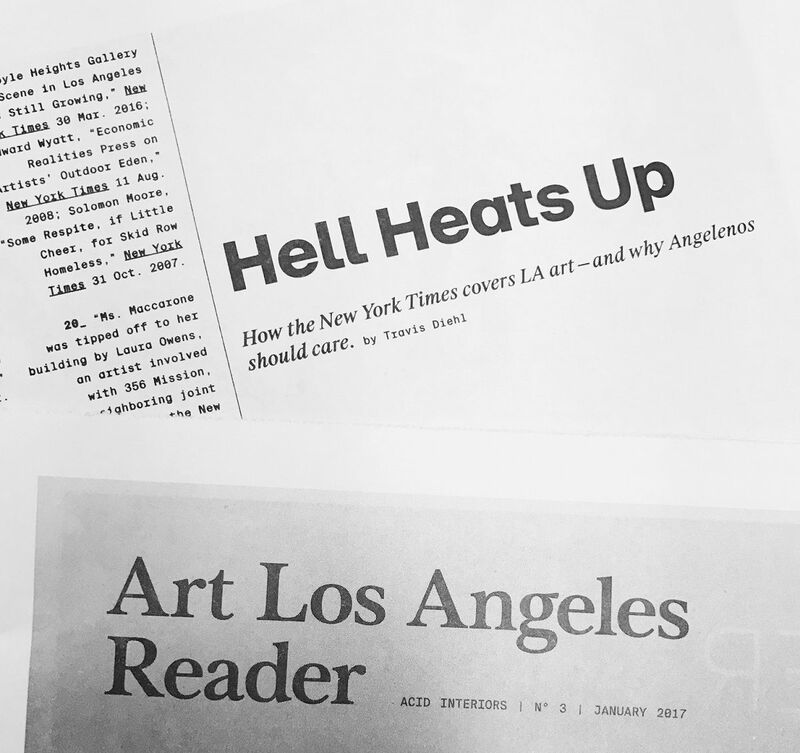 Alongside publication of the Reader is the launch of the Art Los Angeles Reader website, where current and past issues may be accessed online, at reader.la. The issue considers the endless subjectivities of Los Angeles’ interior spaces and how they shape and inform domestic life and artistic creation. From Samara Golden’s engrossing installations to the boastful theatricality of Tony Duquette, the Reader traces notions of power, intimacy and ritual in a series of articles and interviews. As part of its publication, the Reader includes artist commissions made specifically for newsprint. Sean Raspet debuts POOL, a new limited-edition fragrance that builds on his work in flavor and scent that is made purely of synthetic compounds. William Leavitt presents A Few Houses in Los Angeles–ink and pen sketches of mid-century homes taken from the pages of the Los Angeles Times. In the issue, a survey of the hidden nodes of power are explored by Courtney Stephens of Veggie Cloud and artist Micah Silver; the late ‘70s video work of Barbara McCullough and Senga Nengudi is revisited by writer and curator Aria Dean; the New York Times’ boosterism of L.A.’s art scene is scrutinized by Travis Diehl; the significance and legacy of the Scottish Rite Masonic Temple is considered by Catherine Wagley; a long-lost ranch designed by Tony Duquette is remembered by Kate Wolf; and artist Samara Golden is interviewed on her architecture of fantasy by Tracy Jeanne Rosenthal. The fair is pleased to announce the launch of the 2017 issue of the Reader in conjunction with the Reader Lounge, a specifically designated area of the fair where visitors may find copies of the issue and read them at their leisure. Art Los Angeles Reader is published by Fair Grounds Associates and is edited by Tracy Jeanne Rosenthal.